W1064QSF: Altar Q – Yax K’uk’ Mo’ passing the Royal Sceptre to Yax Pasaj There is no question that Altar Q is the most important monument at Copán. 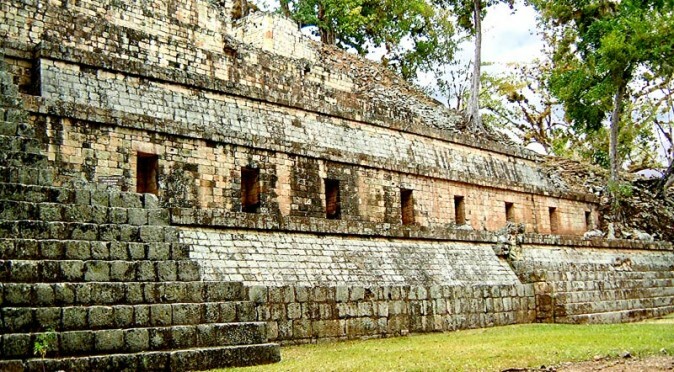 When it was decoded it revealed the history of Copan and also hinted at a rather curious pre-history that may have its roots over 1000 miles away in Teotīhuacān. 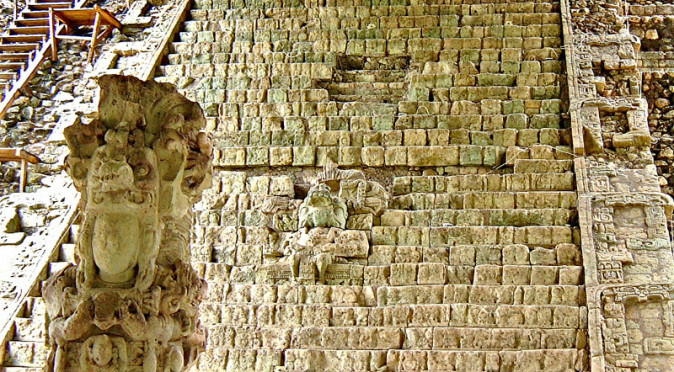 The Altar sits at the foot of the western stairs of Temple 16, in the West Court, which was the principle building group of Copán’s 16th ruler, the mysterious Yax Pasaj Chan Yopaat. Yax Pac, as he known, doesn’t appear to be a direct descendent of the Dynastic bloodline and was instead the son of a Palenque noble-woman. He commissioned Altar Q in 776AD to play the central part in a supernatural landscape which he created using buildings and monuments within the West Court. Temple 16 was also completed in 776AD by Yax Pac, but it was purposefully built over a previous Temple, with the original being left completely intact and “wrapped” within. In fact, Temple 16 has been rebuilt several times and was probably considered to be the home of the ancestors. Deep within the structure archaeologist uncovered a Talud-Tablero style Temple (synonymous with Teotihuacan) with the remains of Copan’s founding ruler, K’inich Yax K’uk’ Mo’, interred with a tripod vase made near Teotīhuacān. 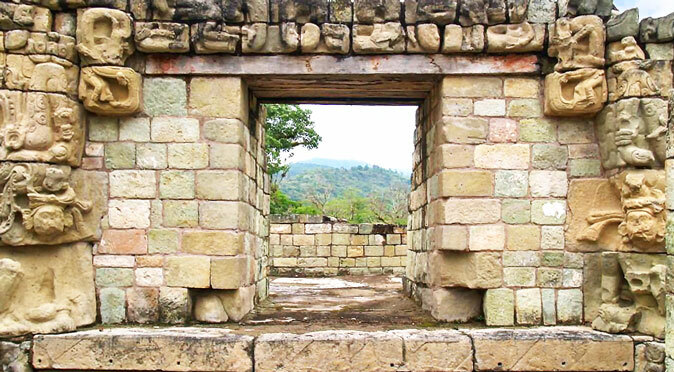 To place his altar at the foot of the western side of this ancient temple structure is an important clue, as the West is the place of the dead, where the sun enters the underworld each evening before rising again in the east in an act of perpetual rebirth – a very strong theme in Mesoamerican religion. 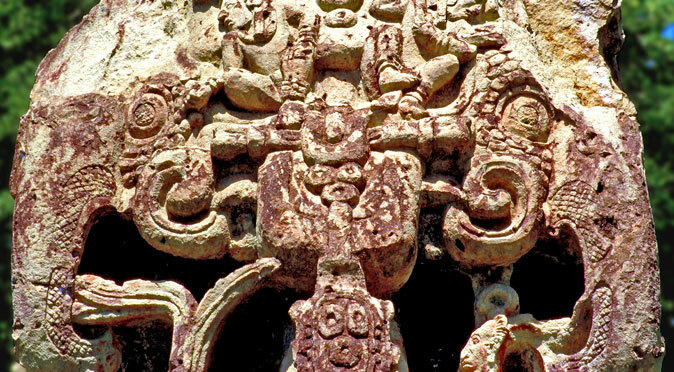 The west is also utilised on Altar Q, with the western face carved with the scene of Yax Pac receiving the sceptre of kingship from Copan’s founding ruler, Yax K’uk’ Mo’ (fig. W1064QSF). This scene is the purpose of Altar Q and the entire West Court, as it tells the story of the deceased king Yax K’uk’ Mo’ descending down the western stairway of Temple 16 and into the underworld where Yax Pac could meet him and receive the sceptre of kingship. 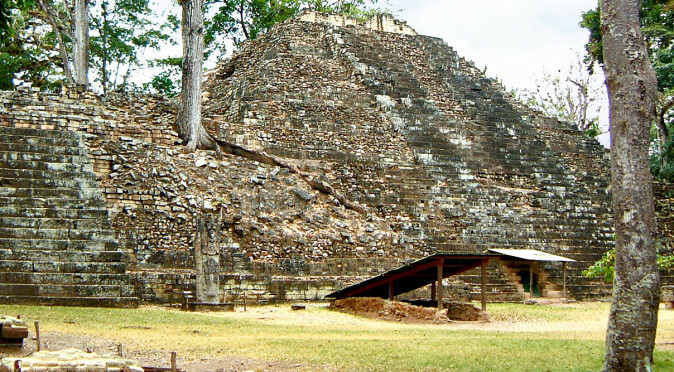 To receive the sceptre directly from Copán’s most revered and most Holy Lord would validate Yax Pac’s claim to the throne and the title of Divine Lord of Copan (there is a full article on the West Court called Templo 11 – The Portal to the Underworld which covers this re-enactment in detail). 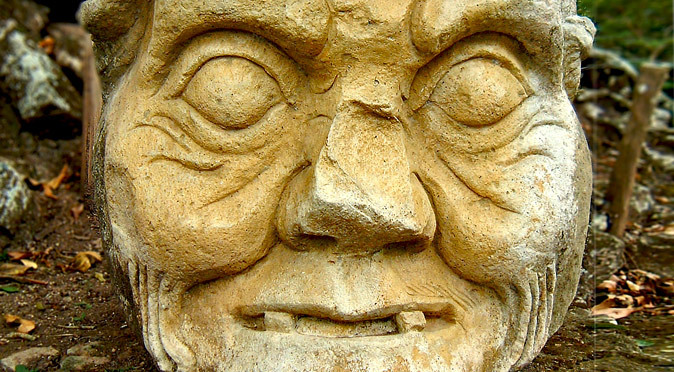 Whilst the purpose of Altar Q is to demonstrate Yax Pasaj’s divine right to the throne, the monument reveals far more, as Yax Pax describes the background to the lineage he wanted so much to be a part of. To associate with his predecessor’s greatness, he had Altar Q made as a square block approximately 1 metre in length per side with each side featuring four of his predecessors – completing a full list of 16 dynastic rulers. In the middle of the western face Ruler 1 (Yax K’uk’ Mo’) passes the sceptre to the new ruler, Ruler 16 (Yax Pasaj). Behind Ruler 1 is Ruler 2, and behind Ruler 16 is Ruler 15. So the west face features, from left to right: Ruler 2; Ruler 1; Ruler 16; Ruler 15. From Ruler 15, the next face features Ruler 14, Ruler 13, Ruler 12, Ruler 11; and so on (click on the images below to see the list of rulers featured on that side). 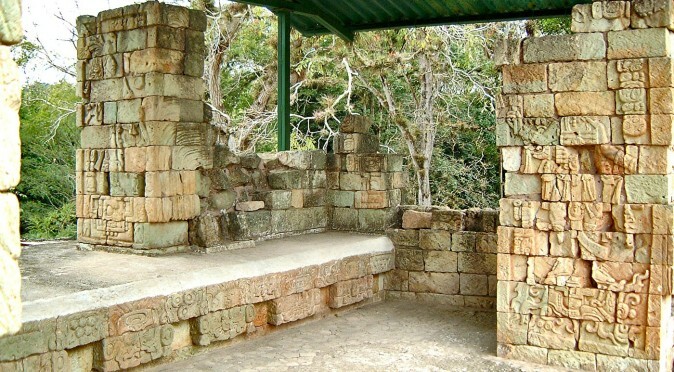 There are two distinct references to Copán’s pre-history and founding within the iconography and the lengthy text written on top of the Altar. 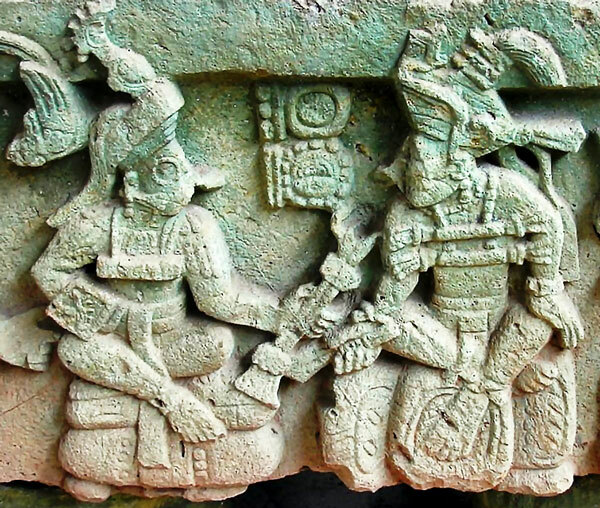 The most revealing piece of information is given to us through the attire of the founding father, Yax K’uk’ Mo’, who is depicted with the distinctive goggles and serpent shield of the Teotihuacano. He also wears either a jaguar jaw which demonstrates his warrior status, or has a skeletal lower jaw, which is indicative of death but also associated with God K (fig. W1064QSF), a central figure to Mayan kingship. The text on top of the Altar then gives a lengthy description of how Yax K’uk’ Mo’ came to power in this remote and already occupied settlement. Altar Q with the glyphic text on top his divine name of kingship) left the “wi te’ naah” or Root House three days later – the Root or Founding House is thought to be a sacred place near Teotihuacan where dynastic rulers were ordained. The text goes on to say that 153 days later K’inich Yax K’uk’ Mo’s “rests his legs” and “is the West Lord” – a title used by another Teotihuacano who visited Tikal in the late 4th century, suggesting that he may have travelled from Teotihuacan to Tikal, with whom Copan remained strongly linked to throughout its history. 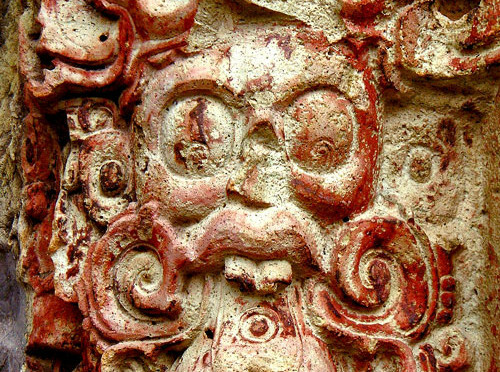 The text finishes by saying finally “he arrived”, at Copan1. Through this narrative and iconography, we are possibly given an insight into the entire history of Mesoamerica during the Classic Era. 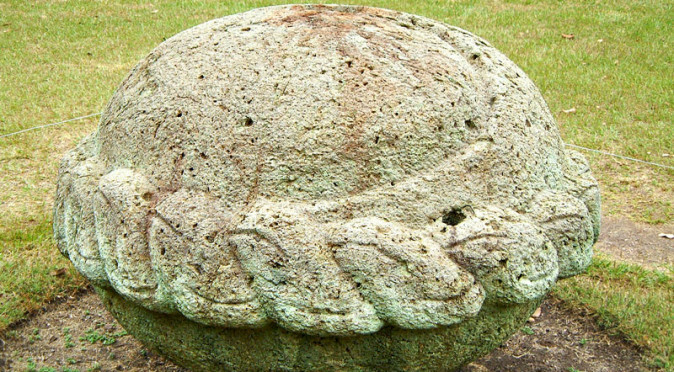 It is certain that Copán was founded to take control of the only jade mining regions in the entire sub-continent. It is also certain that jade was highly prized and more precious than gold, because its rarity and hardy composition meant it could be fashioned into ritual blades and religious ornaments that would have seemed out of this world. 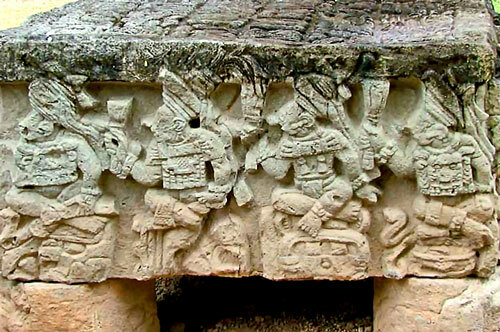 We also know that Copan had strong ties with Tikal and were probably protected its military power. But, the links to Teotihuacan suggests that maybe they were responsible for this foray, and that they used Tikal as a stepping stone to reach the precious jade mines of the south. This single monument, innocuously named Altar Q, seems to unlock an incredible amount of Mesoamerican history. The reason for its commissioning was simply to tell us that Yax Pasaj Chan Yopaat was the 16th Divine Ruler of Copán, but in attempting to prove his validity as ruler of Copan, he has also shown us the inner workings of Mesoamerican religion, kingship, and imperialism. 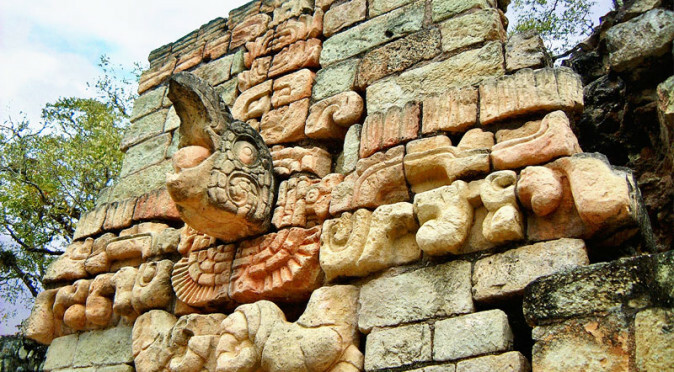 For this reason, Altar Q isn’t just important to the history of Copán, but it is one of the most important monuments in the history of Mesoamerica.